Slow Cooker Ribs are easy to make and crazy tender with a homemade dry rub and brown sugar bbq sauce that caramelizes in your oven. These Are Perfect For Your Summer Barbecues! These ribs are the perfect summer meal, you can serve them with Cole Slaw, Macaroni Salad, Baked Mac and Cheese and the Best Ever Baked Beans. 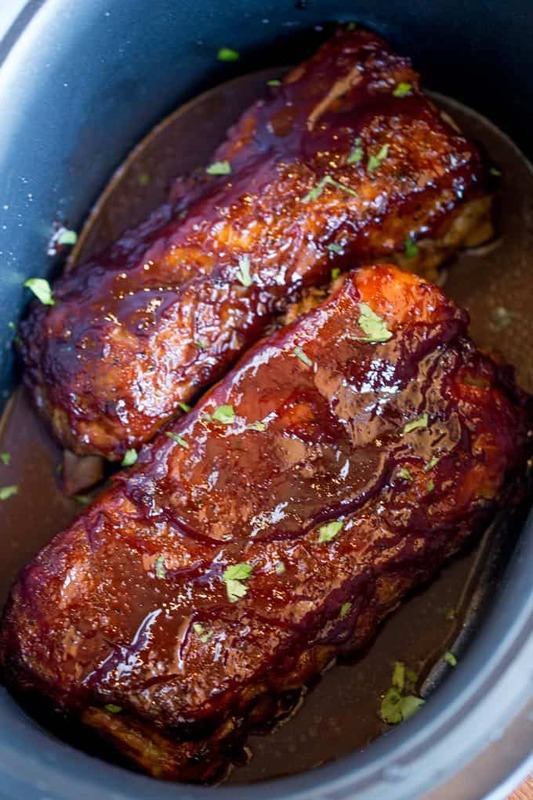 Easy Slow Cooker Ribs covered in barbecue sauce are an easy way to bring a bit of summer into the house without keeping the oven on for three hours, firing up the bbq or learning how to use a smoker! Crock pot to the rescue! Okay, these ribs are delicious, fall-apart tender and with a homemade rub and homemade sauce they’re finger-licking lip-smacking melt-in-your-mouth *yes all the descriptive food sayings here because they are that good* crockpot ribs. Winter is vanishing pretty quickly around here and we’re ramping up for all our classic American summer recipes. With fun party holidays like Memorial Day and the Fourth of July this is a great recipe you can prep ahead and even finish on the grill! Simply pre-cook the ribs then lay them flat and refrigerate them until they firm back up and wrap them in foil. Do this for as many racks as needed depending on how many servings you need. On the day of your even fire up the grill, brush on your sauce and heat the ribs up on the grill until the sauce (and the brown sugar inside of it) starts caramelizing. If you want this layer to be thicker, keep basting it as it caramelizes until it looks good to you since they’re already cooked through. 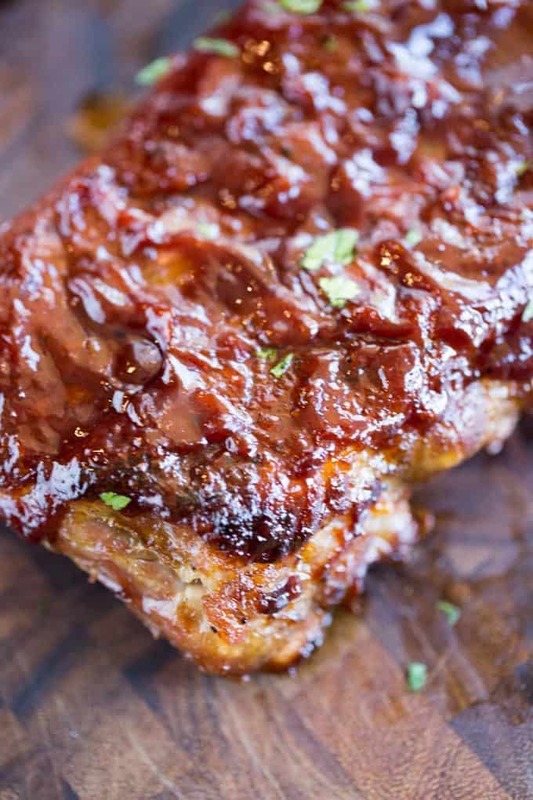 Slow-Cooked ribs are similar to oven baked ribs because they cook the meat and break down the tough connective tissue holding the meat on the bone. Once you’ve cooked the ribs long enough to make them tender you can bring them to room temperature or even refrigerate them and simply cook them in 10 minutes in your oven to finish them off before serving them. For this recipe we use baby back ribs which are the most tender and popular ribs (these are the shortest rack vertically). 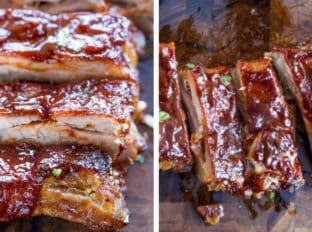 Spareribs are also a connected rack of ribs, cost less but are a less tender rack of meat and finally country-style are not connected but instead are strips of pork with small pieces of bone throughout and while the pork is incredibly delicious it is a much different texture, more similar to pork chops than to ribs. For a classic American bbq ribs recipe stick to baby back ribs (especially if this is your first time you’ll cook ribs) and all your guests will be thrilled. How do I make BBQ ribs in a slow cooker ? The secret to the perfect BBQ Pork Ribs in the slow cooker is to finish them off in the oven under the broiler. 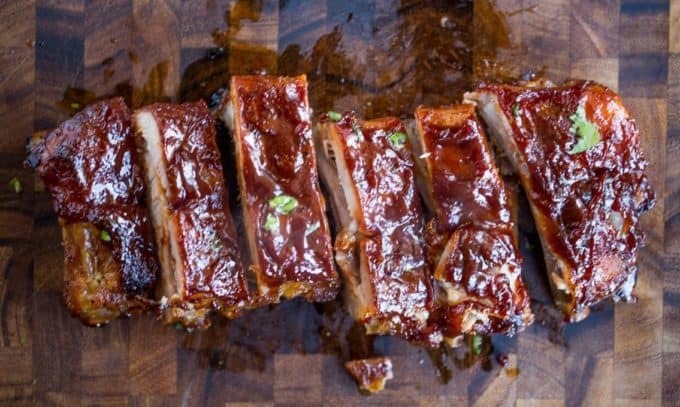 Place the ribs meat side up on a baking sheet, brush liberally with barbecue sauce (homemade or store-bought) and place ribs on a rack 6-8 inches from the top of the oven. With the broiler set on high you will keep the oven door open a bit and watch as the barbecue sauce starts to bubble then caramelize. The thing I love about Slow Cooker Ribs is that they’re perfect for every season. 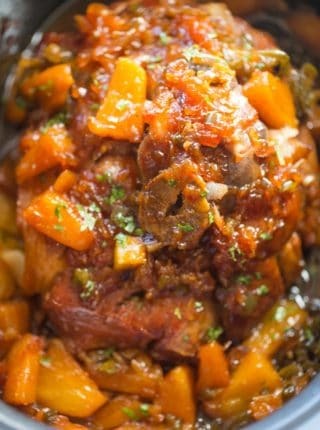 In the winter when you’re missing the warmth and fun of summer you can enjoy a summer meal with no effort and in the summer when it is so hot outside you can’t bear to turn the oven on you can just plug in your slow cooker and have a delicious meal without heating up the whole house! Can you make GOOD ribs in a crockpot? YES. 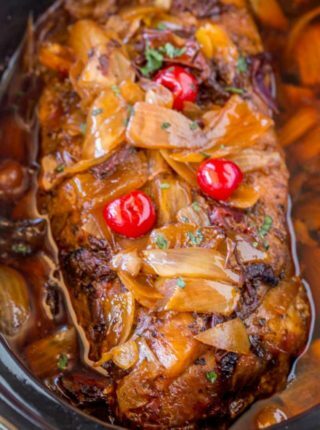 The crockpot is perfect for cooking the ribs low and slow, breaking down the connective tissue in the meat. A quick glazing with barbecue sauce followed by a broil for 1-2 minutes is all you need before serving the ribs. Add all the bbq sauce ingredients into a saucepan and whisk until combined. Bring to a boil, then simmer on low for 45 minutes. If you’d like a tangy sauce you can add in 2 tablespoons apple cider vinegar, if you want a gentle heat swap the Tabasco sauce for Louisiana Crystal Hot Sauce (2 teaspoons). Mix all the ingredients together in a small bowl, rub all over the pork on both sides once the membrane has been removed. For a smokier dry rub flavor you can also add chili powder, or for a spicier flavor you can add cayenne pepper. Slow Cooker Ribs with Coca Cola (or Dr. Pepper): Add one can of coca cola (or Dr. Pepper) to the crock pot along with the dry rub and cook on low for 7-8 hours. Make sure if your ribs have the silverskin/membrane along the bone side of the rack you remove it before adding the rub or cooking. I cook them in the slow cooker without the sauce. I add the sauce just before broiling. Broiling is technically not necessary but the texture and flavors are significantly better when it has some of the sugars in it caramelized. If you choose to skip broiling in the oven stage you can add the sauce in the last hour. Add some spice to the Crock Pot Ribs by adding some St. Louis-Style hot sauce to the ribs before adding the seasonings or even to your sauce. Add a bit of savory flavor (and a passable alternative for a smoky flavor) by adding a bit of Worcestershire sauce to the crock pot ribs before adding the rub. If you want to keep the meat out of the juice in the bottom of the crock pot you can lay the racks on top of onions. How do you remove the membrane from pork ribs? Starting from one end, slide a paring or boning knife just under the membrane but over the bone. Lift and tear it away from the rack in one whole piece. If it tears, start again with the paring knife. How do I cook Country style ribs in a slow cooker? Rub the Country-style ribs well and cook them for the same amount of time. Line the country-style ribs on a baking sheet fat side up, brush with bbq and broil as you would the ribs. 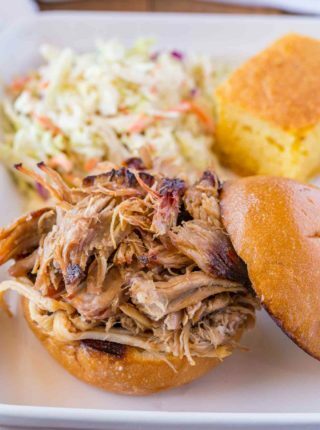 Country-style means the pork is much meatier and the bones are in fragments rather than in a rack, but country style is a cut that is as flavorful as any other cut of pork and often used in pulled pork preparations as well. Next time you can even use spare ribs! What to serve with Slow Cooker Ribs? Potato Salad, Pasta Salad, Cornbread, Homemade Rolls or Fruit Salad would be great options for sides to serve with this main dish. Great recipes for desserts would include Strawberry Shortcake, Vanilla Ice Cream and Chocolate Cake! How long do you cook pork ribs in the pressure cooker? Bring the pressure cooker up to high pressure for 20 minutes. Let the pressure release naturally for 15 minutes before removing. Put the ribs on to a baking sheet, brush with sauce and place 5-6 inches under the broiler for 2-3 minutes. What is liquid smoke? Is it healthy? Liquid smoke is created by actual smoke that is passed through a chamber and condensed into a liquid and sold in a bottle for people to use to add a flavor of smoke to dishes they don’t actually cook in a smoker. 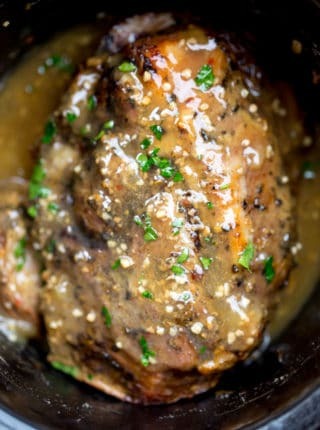 For this reason liquid smoke is very popular in many slow cooker pork recipes. The problem however is that it is as unhealthy an ingredient as is allowable on a store shelf and I can’t reasonably add it to a recipe so I would say no, if at all possible I’d recommend avoiding the ingredient in your cooking. If you’d like a smokier flavor to your ribs I’d recommend a smoked salt in place of your kosher salt in the rub or barbecue sauce recipes. Charlie Rendezvous Dry Rub: In case you don’t want homemade. Tony Roma’s BBQ Sauce: In case you don’t want homemade. Rub the dry rub all over the front and back of the ribs. Cook on low for 7-8 hours (I do 7) or high for 4 hours. While the ribs are cooking make your bbq sauce. 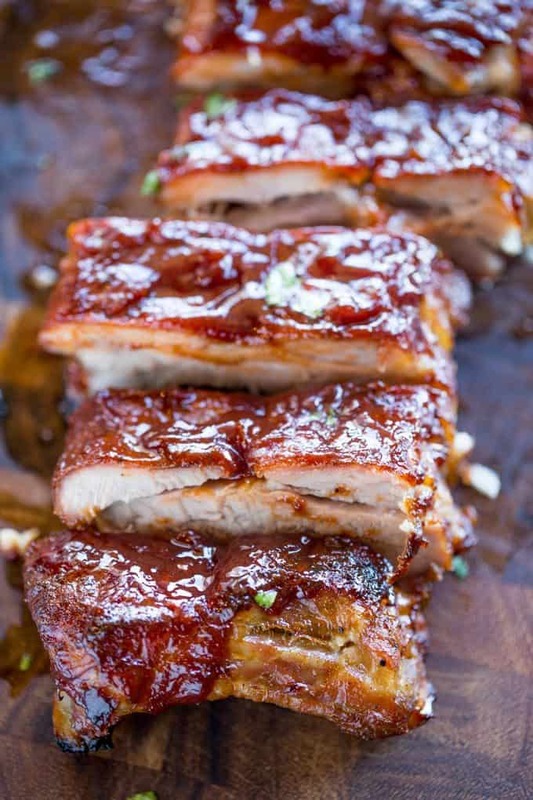 Remove from the slow cooker, place racks onto baking sheet, brush with bbq sauce and broil in your oven for 1-2 minutes until caramelized on the top rack then serve with additional bbq sauce. Mix all the ingredients together, rub all over the pork on both sides once the membrane has been removed. Sabrina, do you just put the rubbed ribs without any sauce in the slow cooker? And the ribs will cook fine? Yes, just the ribs go in. They’ll cook down and release some liquid so don’t worry. It’ll allow them to crisp up nicely. Enjoy! This was so good! Followed the recipe exactly and bought the recommended 2 racks of baby back ribs. Easy to make, full of flavor and my family thoroughly loved how easy they were to eat, with the meat falling off the bone. The only thing I will do differently next time is slow cook them for around 6 hours (on high) as after checking them at this point, and seeing they were wayyyy done, I was unable to get them out of the slow cooker without them falling apart. Also took leftover bbq sauce and added it to our baked beans! Yum! I am ready for summer now! These look really good. I don’t understand how someone can make a comment about a recipe without trying it!!!! Make it first then comment!!!! I have been seeing your recipes on Facebook and print the ones I want to make. I have been pleased with the results and have a stack of printed recipes I can select from. I am diabetic and the nutritional info you provide (and others don’t) is a lifesaver. I wanted you to know how much I appreciate the info. I don’t believe in “diabetic” food and with this info I can make healthy real food.. This is my first time visiting your website. No surprise, it is the most organized and helpful sites I’ve seen. Keep up the great work. So glad you’re enjoying the site! Sabrina this is my first time writting because I’m a new subscriber. I am from Puerto Rico and I want to thank you for the recipes, I love them. I love to cook but never thought of cooking ribs in a slow cooker. Can’t wait to see more recipes. God bless. Thank you for taking the time to comment and let me know! I look forward to seeing you around the site! These ribs looks amazing. I can’t wait to make some. What a great idea, especially when it’s to cold or pouring rain outside. One question, when baking the ribs in the oven, what degrees should I set tge oven for? If using the oven, set the tempature for 300 degrees. Hey Sabrina! 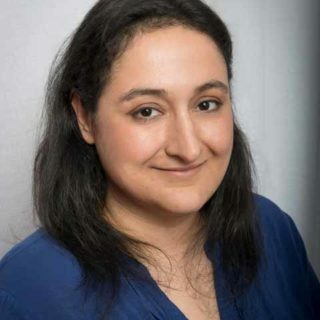 Dang girl, you have an AMAZING site of useful and delicious recipes. 🙂 Thank you for all the recipes and helpful information you have shared. For myself, I have not been cooking for a while, but, that will be changing soon when I move. However, my new place only has a cooktop which is not what I am used to. Thanks to you and a few others, I am actually hopefull I can use a slow cooker to cook healthy AND flavorful food. YES! I have one question if you have a moment, I am wondering about what vinegars taste good in this BBQ sauce? Thanks 4 everything L.
I am so glad you’re enjoying the site and all of the slow cooker recipes!! For the sauce, you can use whatever type of vinegar you prefer. I used a white distilled but you can used a cider vinegar if you like it a bit sweeter. Enjoy! Oh my goodness, that’s so sweet! Thank you so much for the kind words, it has been just over three years and it’s been such a fulfilling journey for my soul and honestly a TON of fun. Seeing these comments completely make my day. Thank you again. Now I can make my husband his favorite meal! One of my favorites – I love barbecue ribs! Oh wow, these look incredible!!! Wow! Get in my belly! This looks so good. Making ribs in the slow cooker is my favorite way to make them! I know, right?! So easy!! I saw a suggestion of putting a can of coke in with the ribs (after adding the spices). When do you add the BBQ sauce, at the end? Do you add water to cook the ribs? When do you add the barbeque sauce? I added the BBQ sauce after removing them from the slow cooker. Enjoy! I’ve always been hesitant to make them in the slow cooker, but I think you’ve changed my mind! They look incredible! Thanks Brandy! Definitely try it! One of my favorites that my mom used to make….this looks amazing! I love anything I can put in the slow cooker! My husband will love these! Slow cooker is a life saving! Congratulations for your new one! Your barbecue ribs look incredible! I think I can smell it! Those look absolutely perfect – so tender and juicy, YUM! oh, man! These look amazingly good! Wait until you taste them!! Delicious! Your barbecue sauce looks HEAVENLY! It’s sticky, mahogany perfection!